2129a, Used Rims, 15x6, 5 lug, 100MM, 00-02, DODGE, NEON, MACHINED FINISH, 5 Y SPOKE PLAIN, ALLOY. A=MACHINED B= CHROME. 3053a, Used Rims, 15X6-1/2, 5 LUG, 4-1/2", 93-97, LINCOLN, TOWN CAR. ALUM CHROME Y SPOKE. 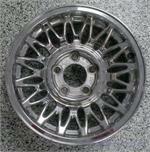 3053b, Used Rims, 15X6-1/2, 5 LUG, 4-1/2", 93-97, LINCOLN, TOWN CAR, 35mm OFFSET, SILVER, Y SPOKE, ALLOY. 3053c, CENTER CAP USED, 93-97, LINCOLN, TOWN CAR. PAINTED SILVER, CHROME INSERT RING, BLACK OUTLINED LOGO. 6-1/2" DIA. 3053c, CENTER CAP USED, 93-97, Lincoln, TOWN CAR. PAINTED SILVER WITH CHROME INSERT RING & BLACK OUTLINED LOGO. 6-1/2" DIA. FOR A 15" Y SPOKE RIM. 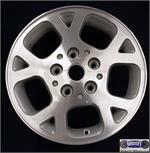 3497b, USED RIM, 16X7, 5 LUG, 4-1/2", 03-05, FORD, CROWN VICTORIA, 9 Y SPOKES, PAINTED SPARKLE SILVER POCKETS, ALLOY. 9027, Used Rims, 16x7 5 LUG, 5" 99-02 Jeep, Grand Cherokee, ALUM 5 LARGE SQUARE HOLES, 5 SMALL TRIANGLE HOLES, Y SPOKE, SILVER POCKETS.